Then I heard that director Sean Penn was struck by the true story of Christopher McCandless a young man who in the early 90 he left everything and everyone to stay in touch with nature to get away from this consumer society! 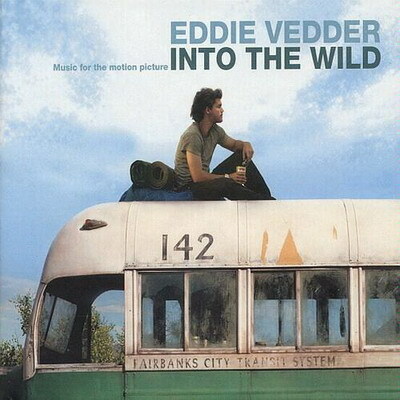 The soundtrack could not be given to the talent of group leader Eddie Vedder, Pearl Jam's grunge! The soundtrack could not be given to the talent of group leader Eddie Vedder, Pearl Jam's grunge! In its own way Eddie Christopher McCandless was a troubled because his youth, Vedder had already passed through one of his inner journey and artistic maturity that nowput it right on the throne of the most 'big rock! Pearl Jam in concert! His album is a reflection of the whole movie would never be any other artist could have done better! Eddie Vedder's troubled singer-songwriter, the taciturn man from the soul-sensitive! There was a song of this album has found that the discounted or made just to make up the numbers! every song is indeed the gateway to some of the scenes in the movie! "Setting Forth”: the way to escape or supertramp McCandless as he wanted to be called, wasready for a world to discover him. No Ceiling: When McCandless finds his promised land '' of Alaska “ and for a moment found himself in the joy, but it becomes a missing son to parents who were the architects of solitude by Christopherin the walls of their house where the misunderstandings were every day! Rise: How many things I did not know that I'd missed in my first year of life so 'I think the young Supertramp at the sight of the forest hills of the ocean that magically appeared in his pilgrimage! Long Nights: Eddie Vedder's voice suffered deep part of the night to tell the adversity that faces a nomad, a young American who had first had all the amenities is now alone against the darkness ofendless hours that no longer pass the tears of repentance fall almost in his face and ask him to go home, leaving her to be this crazy idea to go and live alone in Alaska! Tuolumne: This song can be interpreted by the listener in 2 ways! Tuolumne County is also one of the California Sierra Nevada! The second version is' just a country ballad to play in front of the fire! him from the soul the noble man who wanted to be less nasty and opportunist, he was looking for a companion for life and a lawn where you can take your children! The Wolf: The man left alone in a land still wild as Alaska can not compete with the power of nature and its inhabitants! Foxes and wolves in search of food for the winter cold, McCandless will be robbed of hisgame these carnivores undisputed lords of the forest! End of the Road: the road is finished, a song by the indie pop sound that leaves little to the imagination, but made a strong atmosphere that foreshadows the end of a dream and maybe even a life. Guaranteed: Goodbye big dreamer! Eddie sings and plays this sad song so perfect, who has the talent as Vedder shows that the good things in this case can be made a song with just voice and guitar.